After finishing regional play with five 12’s Division 1 power tournament wins, a silver medal finish at RMR Showdown in the 14’s division, and two bronze medals from Colorado Crossroads National Qualifier and Show Me National Qualifier, Momentum 12 Kia had a phenomenal and unforgettable season. Momentum 12 Kia earned their bid to Nationals in the 12 National division by winning the RMR Zelinkoff Tournament, never dropping a set. During the month leading up to Nationals, 12 Kia was in the gym training hard and getting prepared to compete against the best teams in the nation with the goal of bringing home a medal. On day one of the GJNC tournament, 12 Kia was seeded 12th overall and went undefeated in pool play. Beating Maverick 12 Elite, HPSTL 12 Royal and NYC Juniors 12 National in straight sets. After competition we enjoyed a team river boat cruise. We cruised the beautiful Detroit River, enjoying quality time with teammates and family and taking in the views of Detroit and Canada across the river. Day 2 started with a three-set win over AZ Epic 12 Roshambo and a close three-set loss to the silver medalist ASICS Mavs 12-1 team. After two days of tough competition, Momentum 12 Kia finished their pool 2nd place and were still in the hunt for the gold medal. Day 3, 12 Kia was in a tough three team pool with Sky High Adidas and OT 12 S.Kim. After playing and beating Sky High in three, we were ready to compete against the tall and athletic OT team for first in our pool. Playing with total teamwork and determination, 12 Kia was able to overcome the strong middle attacks from OT and take them down in three sets. This gave 12 Kia the opportunity to play in a challenge match in the afternoon for the eighth seed in the 12 National gold bracket. Momentum drew a match up against Lions 12-1, a team that had won a qualifier and was also having a great tournament. 12 Kia lost the first set and was able to come back with a vengeance. Winning the next two sets by more than 12 points, 12 Kia earned their spot in the gold bracket with the top 8 teams in the USA. After eight months of training and countless hours in the gym, day 4 was our last day playing together. From the minute they stepped on the showcase court, 12 Kia was ready to put all their knowledge and skills to the test against an undefeated, well trained Skyline 12 Royal team. After a tough loss in the first, Momentum battled to take the second, but was stopped in the third set. Momentum 12 Kia rounded out the season with a great showing at the Girls’ Junior National Championships, finishing tied for 5th. The players and coaches on Momentum 12 Kia showed so much grit and determination throughout the season and were so much fun to watch! The future is bright in the RMR Region! NORCO 13 Black finished 29th in the National Division which is higher than any other 13s team from Colorado. The first match of the tournament was against Palm Beach Jrs 13 Elite who eventually became tournament champions. NORCO has an impressive showing against NKYVC 13 Tsunami who eventually finished 16th overall. Setter Emma Grace Moddelmog scored five serving aces and and Outside Hitter Bella Kiefer had a team high passing average (2.12) and hitting percentage (.27). NORCO played fourth out of six teams in pool play, nearly missing the opportunity to advance to the gold bracket. They quickly rebounded on Day 3 defeating both SE MN Juniors Mabel-Canyon and ECVC Hurricanes in two sets. On Day 4, NORCO battled El Paso Wildfire in a three set match to end the season (26-24, 20-25, 15-13). Middle Blocker Izzy Saiki and Outside Hitter Reagan McWhinney each contributed a team high 11 kills and Setter Emma Grace Moddelmog had her best performance of the tournament with 30 assists. Rocky Select 15 Black had high goals since this teams had been to Junior Nationals 3 years in a row and they planned on making it 4. This team played in the most tournaments, attended the most group lessons in the club, and attended the most free holiday tournaments out of every team in the club. 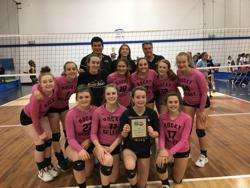 This team competed in the mixed age group taking 2nd in Power 6 in Mixed Division 1 against some very good 17s teams, played in 18s division 2 taking 1st in Power 2, & 16s in the Greely Showdown taking 1st. 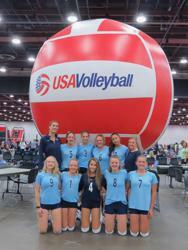 This team had to earn its bid at the JNQ by going 2-0 to earn a National bid to Junior Nationals. The team went 2-3 in pool play at Junior Nationals just missing advancing to the Gold challenge matches. The competition was tough, and this team represented the Rocky Mountain Region & Rocky Select with pride. The team was able to enjoy some team meals, cards in the lobby, and pool time while competing at Junior Nationals. The team finished with a 4-5 record at Junior Nationals. Rocky Select 14 Black started off the season with 4 returning players, 5 players that had never played club, and 2 players from other clubs. With dedication from the coaches and Rocky Select staff this team put in countless extra hours for this team to meet its goals. The team competed in the mixed all season long at times facing difficult days but always improving. At the JNQ the team played the best it had up until that point going 2-0 against some very good competition to earn a National bid to Junior Nationals. The team had a great time at Junior Nationals earning the opportunity to play some of the best teams in the country. Coach Hutch said it was the best the team had played all season unfortunately it was against the best competition. Rocky Select 14 Black mad great individual and team gains over the course of the season due to dedicated coaches, players, and parents. 13Tammy qualified in the National division by winning the RMR junior national qualifier. Colorado Juniors 13 Tammy faced tough competition on their first and second day in Detroit and ending up taking 5th in their pool but truly improved with every match they played. For most of the team, this was their first ever trip to nationals. They battled the final two days to win the Flight 2 Championship! The girls all laughed and learned a lot over the four days in Detroit. They are all hungry for more volleyball! Momentum 14 Alexis started their 2018 GJNC journey in a tough 6 team pool in the 14 National division. They finished 1-2 on day 1 and Went 0-2 on day 2. They fought hard and lost 2 tight 3 set matches on day 3. On day 4 for they finished strong by defeating their final 2 opponents in order to finish on a high note and win the flight 3 division. They overcame difficult circumstances with injuries and tough competition throughout the weekend. 14 Alexis was honored to be a part of such a high caliber of competition and represent Momentum at Nationals. Off the court, they spent their last week together bonding on the Canadian border, mini golfing, visiting the University of Michigan, taking candid photos all over Detroit, and jamming out in the team van. The 2018 Girls Junior National Championship for The Diff 16 Black was a great opportunity to grow as a team. None of the team or coaches had ever been to Detroit before and it was exciting to see a new city. Representing the RMR region, Diff 16 Black played in the National division. The competition was tough and the team battled everyday with other teams from across the United States. The Diff 16's did not finish where they would have like to with 35th overall finish, but they did learn and grow as players. At ​Junior Nationals​ in Detriot,​ we went 6-3 and made it all the way to the ​E​lite 8​!​ ​Overall , the team finish​ed​ 5th​,​ working​ very well together especially ​in our match against Arizona EVJ 15-1N Tempe​. It was a tough match, going 3 sets, but we came out victorious: 25-27 25-22 15-13. ​Our final match was hard fought against A-5 South 15-1 Joe​, the ultimate 15 National Champions​​​. Our start was a slow but​​ ​we​ team pulled together and fought for every point. Overall the team was proud and happy ​to compete and place 5th at Junior Nationals! Our team was very excited to qualify and go to Nationals in Detroit. We had worked hard all year and this was our time to really enjoy being together and competing as a team one last time on the biggest stage in club volleyball. We played well enough on days 1 and 2 to take the next step towards a chance at a medal. Our 3 team power pool on day 3 ended in a three way tie when the top seed lost to the team we beat handily. We lost a tough one in a tie break against the team we had just beaten. While that took us out of medal contention, we bounced back on day 4 to win 2 straight matches and become Champions of the Broze Division. Their ability to move past the disappointment and focus on winning the Broze division was a testament to our team’s character. Every member of our team played a vital role this weekend and all season long. As coaches, we are very proud of the girls on our team. They are excellent young women who treat each other with respect and play to win. It was a great way to end our season! 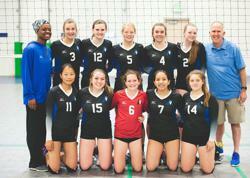 Front Range Blue won the National Bid through the RMR qualifying tournament. Playing hard Blue found themselves in a 3 way tie for 3td place. After wining 2 playoff sets Blue finished 3rd in pool. Advancing to a 3 team pool, Front Range 161 found themselves tied again and facing another tie breaker situation. They competed hard but lost 22-25 to LVA. That pool finish placed Blue in the Bronze division on day 4. They matched up against Puget Sound and in a tough fought match, lost in 3, 12 – 15. Facing ties in both of their pools, shows how hard this team fought, finishing 21st in the National Division.